Protocol for the validation of the cleaning validation of the pharmaceutical manufacturing equipments. The purpose of the study is to validate the analytical method for determination of traces of API contents in Swab & Rinse samples and to establish documented evidence and provide the procedure for the same. The scope should evaluate the acceptability of an analytical method for determination of traces of API contents in the swab and rinse samples by HPLC. This protocol should define the procedure, documentation, references, acceptance criteria and results evaluated for determination of traces of API contents in Swab & Rinse samples by HPLC. It should include the approval of the individuals who have performed the validation study, supervised the validation, completed the records, performed the testing of the product and maintained the equipment. Training should be given to the concerned persons and training record should be maintained. Soak the swab sample in 5.0 mL of diluent. Sonicate for about 10 min. Filter the solution through 0.45 μ syringe filter and inject into the HPLC system. Filter the rinse samples through 0.45 μ syringe filter, discard first few mL, fill the HPLC vials and inject into the HPLC system. Equilibrate the column with mobile phase for 30-45 minutes. Separately inject blank (single injection), standard solution (five Injections) and sample preparations (single injection) and record the response of the principal peak & other related peaks. 1. Inject the blank solution. Disregard any peak due to the blank solution in the test solution. 2. The RSD of the peak area of API in five replicate injections of standard solution should not be more than 2.0%. Calculate the amount of API present in ppm in the rinse sample using the following formula. The amount of API recovered from the effective surface area of equipment should not be more than 10 ppm to take the subsequent batches. To demonstrate and verify that the system suitability parameters of the chromatographic system are adequate for the subjected analysis. The RSD of the peak area of API in five replicate injections of standard solution should not be more than 2.0%. • Provide an acceptable degree of linearity and precision when applied to samples containing amounts of an analyte within or at the extremes of the specified range of the analytical procedure (Range). Prepare a series of standard preparations (minimum five concentrations) of API over a range starting from (i.e.0.1% of standard concentration). Inject each of the standard preparation in triplicate and then take the average area for calculations. Plot a graph of concentration vs peak area to establish LOD & LOQ of API by regression function. Plot a linearity graph of a concentration (ppm) versus average area at each level and determine the slope. The slope S may be estimated from the calibration curve of the analyte. The estimate of σ may be carried out based on the calibration curve. Record the observation in Table-2A & Table-2B. Determine the LOD and LOQ concentration level from the following formula. Where σ = The residual SD of the regression line. S= The slope of the calibration curve. 1. The system suitability criteria should pass as per analytical method. 2. Derive the concentration for LOD & LOQ level from linearity studies. 3. The Correlation Coefficient ‘r’ should not be less than 0.995. Inject LOQ level in six replicates to perform the precision at LOQ level. Record the results in observation Table-2C. The RSD of six injections at LOQ level should not be more than 10.0 %. To evaluate linearity, prepare standard solutions of API of six different concentrations (i.e. LOQ to 200% of target concentration). Inject each of the standard concentration in triplicate. Plot a linearity graph of concentration (ppm) versus average area at each level. Calculate the correlation coefficient, slope (m), Y intercept and record the observations in Table-2D & Table-2E as given below. 2. Correlation Coefficient ‘r’ should not be less than 0.995. To demonstrate that the analytical method is capable to yield data values close to true values. This described as follows. Prepare a standard stock solution of the drug substance in the selected solvent and spike separately 0.5 mL for 50%, 1 mL for 100% and 1.5 mL for 150% respectively on the 10 cm x 10 cm SS 316 L plate and disperse evenly. Allow the plate to dry and perform swabbing. Transfer 5 mL of diluent to a cleaned test tube. Place a clean swab into the test tube. The swabbing should be done so as to cover the entire surface by making perpendicular vertical and horizontal strikes. Care should be taken to lift the swab at the end of each strike made on the SS plate. Collect the total swabbings into the test tube containing 5 mL of diluent and sonicate for at least 10 minutes and dilute to 10 mL with diluent. The concentration of test solution should be close as that of target standard concentration. Filter the solution through a 0.45µ syringe filter. 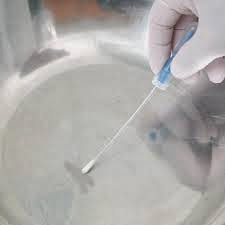 Similarly, prepare controlled blank by dipping the swab stick in 5 mL diluent & sonicating it for 10 min. Then, inject diluent blank, controlled blank, standard and test solution into the chromatographic system. Calculate the Amount of residue recovered “in ppm”. Vs = Volume of Standard spread on the 10x10 cm SS plate. Inject blank, controlled blank &standard solution and each recovery level as per the following sequence. Record the results in observation Table-3A & Table-3B. 2. The recovery from SS plate in residue analysis should be between 70 % -130 %. 100 % & 150 % levels of target concentration of API (i.e. 50 % - 150% of 10 ppm) respectively. Add drug amount at LOQ, 50%, 100%, and 150% levels to the placebo respectively. Prepare each concentration in triplicate & inject once. Calculate and record the percentage recovery of API in observation Table-4A, Table-4B &Table-4C. 3. Average percent recovery from 50% to 150% should be within 90% to 110% of target concentration (theoretical value). To determine the stability of swab sample solution. Prepare the swab sample solution at 100 % level as per the test procedure in ‘Recovery on SS plate’ parameter (refer section 8.0), and inject the solution at zero hours. Place the same solution at room temperature (22ºC ± 2ºC) and inject after 2, 4, 8, 12 and 24 hrs. Calculate % recovery at different time intervals up to 24 hrs. Record the observations in observation Table-5A & Table-5B. To demonstrate that the analytical method is unaffected by using filtration technique as well as by centrifuging the sample solutions. Prepare the sample at 100 % level as per test procedure in ‘Placebo Recovery’ parameter (refer section 8.0). Filter the sample through 0.45 µm syringe filter. Centrifuge the same sample at 2000 rpm for 15 minutes & also filter the same sample through Whatman filter paper No. 1. Record the results in observation Table-6A & Table-6B. 0.45 µ syringe filter and unfiltered (centrifuged) sample should not be more than 2.0. Whatman No.1 filter and unfiltered (centrifuged) sample should not be more than 2.0. 4. The filtered samples should not show any extraneous peak as compared to unfiltered (centrifuged) samples. Record the recommendations or suggestions based on the interpretation of the results and reference documents where required in the validation report. - Changes in the analytical procedure. The degree of revalidation required depends on the nature of the changes. Annexure should be attached to the validation report.